This is something I’ve often thought about, so I knew right away fantasy metals were going to find their way into Real Steel. Titanium is very different than steel, and it does some things better than steel. Titanium is very tough. Tougher than steel. But it’s not capable of the same toughness and hardness combination that steel is capable of. That steel can be heat treated to the desired hardness/toughness combination needed for a particular job makes it the best choice for blades, except in some very specialized situations, none of which have anything to do with “normal use” blades. Titanium wasn’t discovered on our timeline until 1791 CE, and practical applications for it weren’t developed until sometime much later. For our purposes here, the most important characteristic it has is its toughness. Although it was discovered too late to be used in pre-firearms armor, it is used in modern armor. The US Air Force A-10 Thunderbolt, better known as the Warthog, contains a 1,200-lb. titanium “bathtub” to protect the pilot and electronic systems. Another important characteristic is memory. Some alloys of titanium “remember” their shape and can return to that shape after being forcefully deformed. Reality often has elements that are just as cool as fantasy. What about Adamantine and Sky Metals? My first thought when I heard about sky metals was iridium. Iridium is the second densest element known (when using some calculations, it’s the most dense), and it is hypothesized to have been deposited on earth by an asteroid. I’m not certain, but there’s a good chance that the whole idea of fantasy sky metals grew from iridium. Iridium is found in the densest concentrations at the Cretaceous–Paleogene (K–Pg) boundary. I think it would be interesting to attribute various sky metals, each with unique properties, to various impact events. I think there are two major considerations in creating fantasy metals. The first, and most important to backstory, is the origin of the metal. Is it naturally occurring? If it is, how did it get there? Are its properties inherent to the element(s) it’s made of, or was it affected by its environment? If the metal isn’t naturally occurring, how was it created? By magic, or by the application of mundane or extraordinary physics and/or chemistry? 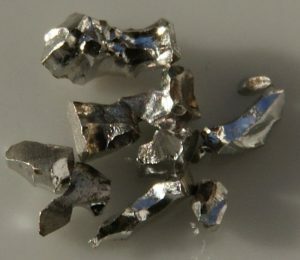 The second consideration, and the most important for gameplay, is the metal’s properties. Can it bypass AC and/or DR due to a magical or physical property? Is it very light, and therefore very fast, or is very dense and tough, and therefore unbreakable? Do its properties change under certain circumstances? Does it interact with its wearer or environment in a way that can create benefits, or perhaps, sometimes, deficits. I encourage GMs and players to come up with new ideas for new substances and items made from them. It’s all well and good to use what’s in a published module, but I always think it adds fun when there’s an element of homebrew added to a game. I’ve deliberately left this somewhat vague. I’d rather drop a kernel and have you take it from there. Think about your options. Use reality to seed and influence your creativity, but don’t be constrained by it. Keep it new. Keep it fun! This was a fantastic piece. @Jon Sawatsky – Thank you so much! Real Steel is always fun for me, but to be honest, I needed a change of pace from what has become the “norm”. I will continue to cover individual pieces that I make, as well as processes and history, but I hope to include something more “gamey” on a regular basis. @Richard Booher – That’s a great wiki, Richard, thanks for sharing it. Great idea to use Malignite, we’re definitely thinking along the same lines. * “Goblin Chrome” – Cobalt. Kobolds mine it and use it to strengthen iron weapons. * “Elven Chrome” – Aluminum. Light and strong, much better for armor than weapons. * “Dwarfsteel” – Maraging steel (look it up!). Heavy, durable, reworkable. Better for axe chops than sword slices. * “Titan’s Chrome” – Titanium. You covered it pretty well up there. * “Black Adamant” – Alloyed Iridium. Very heavy, absorbs light, very intimidating. @mujadaddy – I have heard of maraging steel, but it isn’t used for blades (real world), so I never investigated it. Based on your recommendation, I just looked it up. It’s fascinating! Wouldn’t maraging steel be a good fit for war hammers and maces? @Louis Agresta – It sure seems like it would. I’m very curious as to how well it forges, forge welds, and MIG / TIG / stick welds. Precisely so. I was checking up on materials and for some reason I was fixated on making “Dwarfsteel” some kind of tungsten-alloyed steel, but when I learned a new word (“maraging”) and saw the description (“suitable for engine components, such as crankshafts and gears, and the firing pins of automatic weapons that cycle from hot to cool repeatedly while under substantial load. Their uniform expansion and easy machinability before aging make maraging steel useful in high-wear components of assembly lines and dies.”), I immediately thought of the Dwarves, using highly fault-tolerant, reworkable, thick heavy parts. No problem, happy accident I found you, and had within the last week written up what I posted, as part of a d20 table of alchemical equipment materials (wiki/look at Hepatizon and Corinthian Bronze sometime!). Yes, reading about maraging steel really got my imagination running: heavy, durable blunt metal for the Dwarves versus the idea of brittle, razor-sharp alternatives for the Elves. However, actual real-world welding properties is a bit beyond my scope, haha. @mujadaddy – I’m happy you had the happy accident. You’ve certainly added to the discussion. I always thought that Compacted Graphite Iron (http://en.wikipedia.org/wiki/Compacted_graphite_iron) would make a good fantasy metal. Silicon bronze is commonly used, but I’d never heard it called “Herculoy”. Now it’s even cooler! I’m not sure about the process, but I’ve heard that its fairly tricky. When FCA was trying to source an American supplier for the VM v6 diesel block I heard there was just a single foundry that could accommodate CGI. That was a couple of years ago and may have had as much to do with volume as with technique. Well, some quick research seems to indicate that CGI is cast into it’s near final shape and then machined to final tolerances. I can’t quickly find any details on heat treating it, so perhaps it is used “as cast”. All this would indicate that what you said about a single foundry producing it is based on a tricky, if not proprietary, process. It’s been around since 1965, so it has probably been investigated as a blade material, and rejected. I agree that it, or something like it, could be made into a very cool fantasy metal. Perhaps a way to produce a very high carbon steel that is substantially harder *and* tougher than common steel. This is a great article. It is something I have really though about to making a variety of homebrew systems for materials. It is so easy to just keep going further and further into the complication of each specific material element. If that is your groups thing, great! But I found that it eventually became like a mini game in itself (messing with so many specific properties of each) and distracted from our game. So now we try to stick to special metals have maybe 1 property that affects stats. More importantly, and more fun IMO, is that these metals have the cool backstories, history, creation, which is really the source of how “awesome” something might be. @RPG GM – Thank you! My son is very much inclined to “over build” everything he builds and creates for gaming. It certainly can interfere with play if it isn’t managed, but it does make the story more interesting. As you say, how much depends on your individual group. There is no doubt that Mithril is applied version of electrum. Now what is electrum, you may ask? Well, electrum is the alchemical transmutation/amalgam of gold + platinum into the highest noble metal.